All three of these thrushes have slightly different shades of rufous-brown on the back and crown. 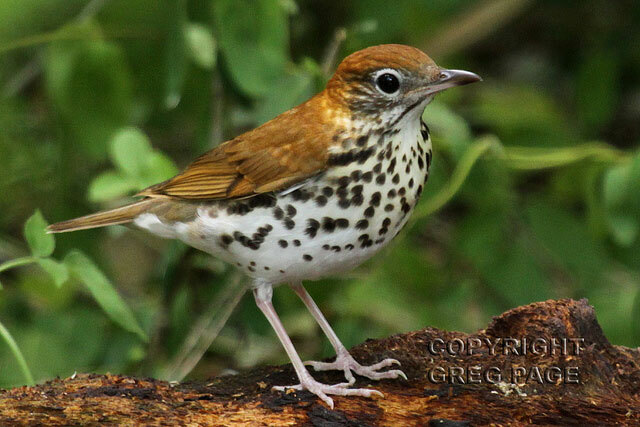 The Wood Thrush (bottom) is also slightly larger and broader. The spotting on the breast of a Wood Thrush is also a deep brown on a whitish background with strong spotting all the way to the belly. Both the Swainson's Thrush and Hermit Thrush have weaker spotting that fades as it moves toward the belly. The Swainson's Thrush has a slightly more washed-out look around the upper breast. The Hermit Thrush is the only thrush in this group where the tail color changes to a warmer rufous color from the gray-brown body color of the back and nape. Status and Distribution in North-central Texas - The Wood Thrush (Hylocichla mustelina) is mostly an uncommon spring migrant from Dallas County eastward. A few birds will nest on the eastern edges of the North-central Texas area map. The Swainson's Thrush (Catharus ustulatus) is a very common migrant through most of North-central Texas. 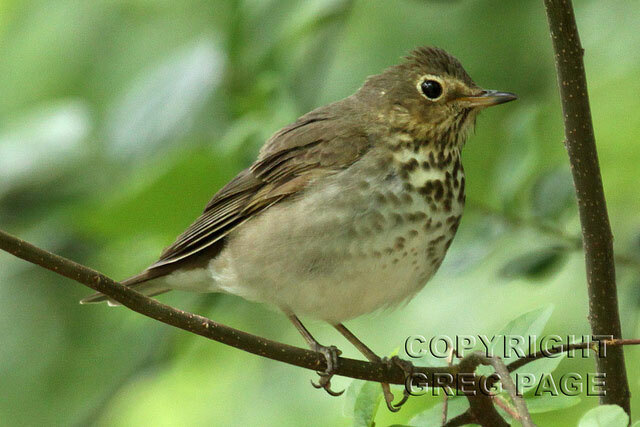 The Hermit Thrush (Catharus guttatus) is the only thrush in this group that is mostly relegated to winter status. It is a rare migrant in spring. Swainson's Thrush, Galveston County, Photo by Greg Page. Note bold eye ring and cream-colored lores. Hermit Thrush, Bell County. Photo by Gil Eckrich. Note warm, rufous tail contrasting with gray-brown body color. Wood Thrush, Galveston County. Photo by Greg Page. Note crisp, dark spots on white breast.